CARD ONE: Hold both cards curving toward the right. 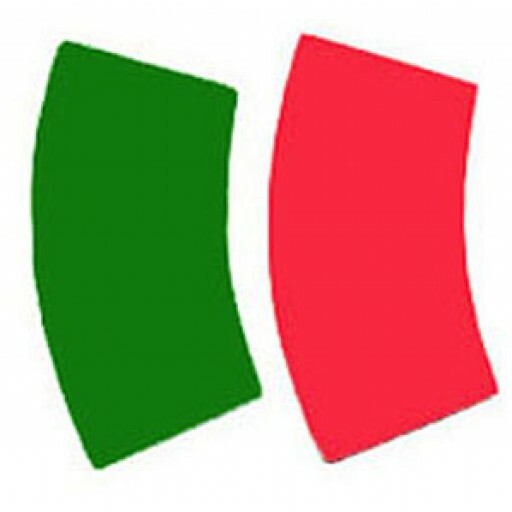 Which is bigger, red or the green? Both are the same. Our eyes are often fooled by optical illusions. Speaking of eyes -- Would you sell an eye for $1 million? How about both for $20 million? No one in his right mind would. Your eyes are priceless, yet they are merely the windows of your soul. Jesus said that your eyes are worth nothing compared to the value of your soul: "If your eye causes you to sin, pluck it out. It is better for you to enter the kingdom of God with one eye, rather than having two eyes, to be cast into hell fire" (Mark 9:47). He asked, "What will a man give in exchange for his soul?" (Matt. 16:26). There is nothing as important as your salvation. So, do you think you will go to Heaven when you die? CARD TWO: Check yourself by going through the Ten Commandments: How many lies have you told in your life? Have you ever stolen (the value is irrelevant), committed adultery (Jesus said, "Whoever looks at a woman to lust for her has already committed adultery with her in his heart" - Matt. 5:28), or murdered someone (God considers hatred to be murder - 1 John 3:15)? Have you loved God above all else? Be honest. You know you will be guilty on Judgment Day, and therefore end up in Hell. But Jesus showed how much God loves us by dying on the cross to take our punishment, and then rising from the dead. Today, repent (confess and turn from your sin) and trust in Jesus Christ. Then read the Bible daily, and obey it. God will never fail you.